The poet of fire, of water, or of earth does not convey the same inspiration as the poet of air. of such a landscape … this is what is required in film. Through an analysis of Robert Eggers’ The VVitch: A New England Folktale (2015), I want to examine how the materiality of earth and air has a special role to play in folk horror. My contention is that mood in the cinema often involves a making visible of the air and that The VVitch is particularly invested in moody, imaginative interminglings between air, atmosphere and the environment. Set in 1630s New England, The VVitch tells the story of a devout English Puritan family who are beset by witchcraft and satanic possession. Following a theological dispute with the local Puritan community, William (Ralph Innerson) relocates his family to a remote region; however, nothing will grow in the bleak surrounds. Before they venture out into the forest in search of food, William assures his eldest son Caleb (Harvey Scrimshaw) that they “will conquer this wilderness … it will not consume us”. As the vision of the camera drifts slowly towards the forest, clanging sounds foretell danger. This is not a wilderness that will be conquered or owned. In the second quotation that heads this article, Béla Balázs intimates that landscape in film (be it alluring, mysterious, magical, demonic or otherwise) reveals a non-human sensuality. For Balázs, as well as many other early theorists of mood, “landscapes, objects, [and] architecturally designed spaces all possess character and mood”. Returning to the importance of mood in early film theory (by way of thinkers such as Georg Simmel, Balázs, Jean Epstein and Lotte H. Eisner), I note a recurring concern with the non-human materiality of mood, illustrated by focusing on landscape and environment as well as manifestations of air on-screen. Bringing Bachelard’s philosophical work on the imagination of the elements together with mood, I argue for mood in the cinema as an ambient or diffusive sensuality. As we shall discover, mood does not belong to a single entity or body, least of all the human. In The VVitch, horror is imagined as aerial. The supernatural moves in and out of visibility here and is also shown as moving between different human characters, animals, objects and the environment. After circulating its rendition of folk horror in mobile, partially visible and highly atmospheric terms, The VVitch eventually dispenses with the primacy of the human being altogether. To create the pre-modern world of The VVitch, Eggers drew intermedial inspiration from European painting, English woodcuts, children’s fairytales, literature and other key historic sources. 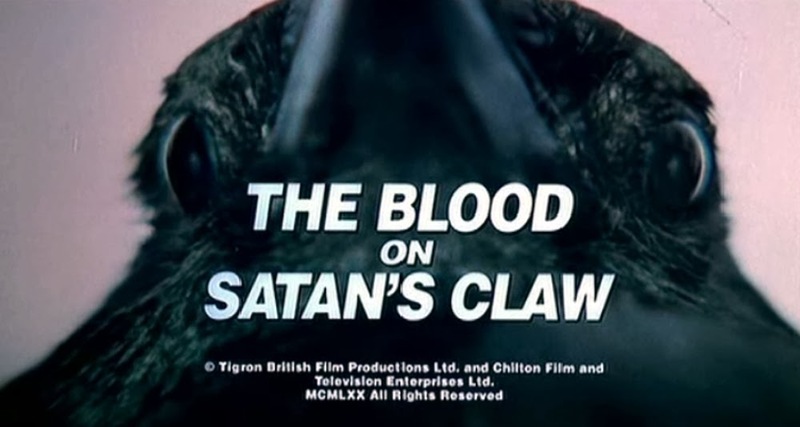 The distinctive typography and spelling of the film’s title design was adapted from a Jacobean witchcraft pamphlet. The flowing lettering of the film’s subtitle was modelled on the first printed publications of English poet, John Milton. The film’s characters speak a form of early modern English, complete with northern British accents. 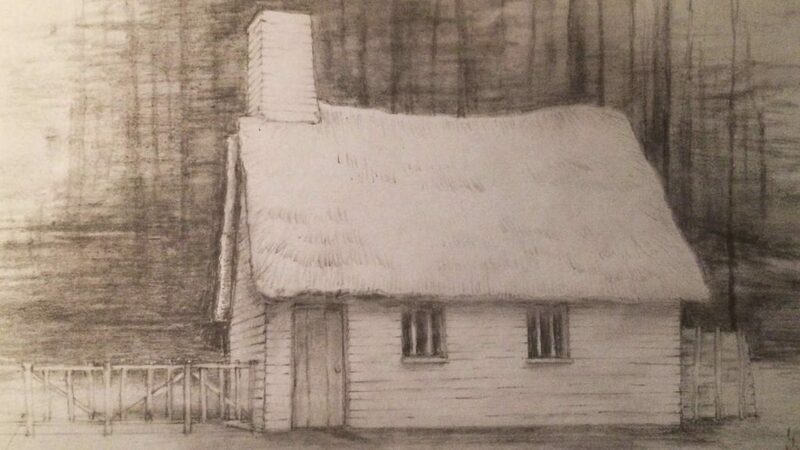 While the film itself was shot on location in Canada, the family’s thatched farmhouse was reconstructed from surviving plans of one of the oldest timber houses in New England. Costumes were fabricated out of rough wool and linen. Even the film’s handheld lanterns are designed to emulate the antique effect of light refracted through translucent animal horn. While displays of historical and/or literary veracity are nothing new in the costume drama, The VVitch combines realistic period detailing with blatantly imaginary spaces and figures. Drawing together British, North American and European folklore surrounding the witch, the film also blends the iconography of fairytales (immense forests, a bright red riding cloak, a poisoned apple) with satanic lore. The witch and the Devil can appear in different guises – as young or old, human or animal. Inspired by the Spanish artist Francisco de Goya and his Osuna witch paintings, in particular, the devilish Black Phillip functions as a reprisal of the satanic goat. Without question, many of the film’s signature scenes of horror can be traced back to medieval, patriarchal paradigms relating to the ‘black magic’ of female witches. As an affiliate of the Devil, the early modern witch was reputed to grind up the flesh and bones of innocents to concoct ointments for her flight to the Sabbath. Shortly after the infant son Samuel (Axtun Henry and Athan Conrad Dube) vanishes into ‘thin air’, we learn that the child has been kidnapped and killed for precisely this purpose. As Barbara Creed explains, the female witch has long been aligned with the unruly forces of nature. In medieval folklore, the witch is said to contaminate the very air, earth and water that surrounds her. Warped by the proximity of the witch, the family’s newly-planted corn turns rotten and their hens lay stillborn chicks, recalling pre-modern tales of local witches who destroyed crops and curdled milk. Linked to the imagery of an “elemental earth” and to recurrent themes of autumn and death, the witch has also been associated with the colours grey, black, white and red. Eggers’ film deploys similarly muted colours, chromatically draining the New England landscape and bodies in the landscape of all vitality, save for momentary pockets of red (a colour that Eggers also associates with the witch). After Samuel vanishes during a peekaboo game, the film holds on an image of his blanket, left lying on the ground; its folds bear the still-visible contours of the child’s shape. “Sam?” the family’s eldest daughter, Thomasin (Anya Taylor-Joy), cries out. The intentional focus of the camera shifts from Samuel’s blanket towards the forest. Dense trees obscure the cloaked figure of the witch hurrying away. As with medieval folklore and with children’s fairytales, The VVitch associates female witchcraft with the immanence of nature and especially with the locale of the forest. In her book Our Old Monsters (2015), Brenda Gardenour Walter describes how depictions of witchcraft underwent a significant shift during the fourteenth and fifteenth centuries, shifting from the toxic to the explicitly satanic. In the western imagination the satanic witch has multiple powers: she is able to fly or to levitate, to concoct poisons, control the weather, command or possess animals (toads, bats, snakes) and to harness the extreme “forces of nature such as tempests, hurricanes and storms” for her own purposes. In Eggers’ film, the ontology of the witch is no less real or tangible than how “a tree is a tree” or “a rock is a rock”. Belief in the power of witches is also a given. To recreate that belief for a contemporary audience, Eggers explains how showing the materiality of the world is necessary as “that’s what makes you believe in witches”. By emphasising nature and the physicality of the world as well as scenes of witchcraft, The VVitch rediscovers and reworks folk horror filmmaking. In his book Folk Horror: Hours Dreadful and Things Strange (2017), Adam Scovell identifies the supernatural as being essential to “many Folk Horror forms, whether portrayed as real and fleshed out … or as part of a belief-system”. Typically, folk horror is affiliated with a number of cult British films and television plays that were made during the late 1960s and 1970s. While Robin Hardy’s The Wicker Man (1973) remains the most well-known example of the tradition, two earlier examples from Tigon British Film Productions alert us to folk horror’s ‘fleshed out’ portrayal of violence within period settings. Both Witchfinder General (Michael Reeves, 1968) and The Blood on Satan’s Claw (Piers Haggard, 1971) are set in seventeenth century rural England. While the latter film uses the iconic English countryside to stage the occult, the former showcases human brutality. In Witchfinder General, women accused of witchcraft are sadistically hunted, tortured, raped and executed by the notorious English witch-hunter Matthew Hopkins (Vincent Price) and his affiliates. In The Blood on Satan’s Claw, witchcraft is portrayed as demonic and also as implicitly feminine. It is pitted against its masculinist containment by figures such as the Judge (Patrick Wymark). In both films, the ‘civilised’ social order is rife with depictions of human cruelty, male pride, puritanical repression and hypocrisy. The VVitch begins with a close-up on Thomasin’s face, her large pilgrim hat and pale collar dominating the frame. While the camera stays on Thomasin, it is her father who speaks. “What went we out into this wilderness to find?”, William asks the assembled Puritan community. The film cuts to a close-up of Caleb then to the fraternal twins, Mercy (Ellie Grainger) and Jonas (Lucas Dawson). All the children are introduced as figures looking upwards to their father and listening obediently. After William accuses the settlement of being “false Christians” for not preaching the Gospel, two different shots reveal the clear gender division and hierarchy of the settlement. Only certain men in particular spaces may speak. In the Puritan world of The VVitch, women have no agency – although the film’s ecological imagination of the forest harbours other possibilities for them, as we shall discover. After William is offered a choice between banishment and adherence, we see Thomasin quickly tilt her head in his direction; however, her hat and the camera angle obscure her facial expression. Again, it is William who speaks and he who determines the family’s fate. The film then cuts to a receding view of the plantation seen from Thomasin’s vantage point as she departs on the back of the family’s wagon. The heavy doors of the settlement close with a thud. After William moves the family away from the Puritan plantation, Eggers’ film never moves beyond the remote environs of the farmhouse or the surrounding forest. In place of aged stones and ruins, ploughed fields, English villages and foggy moors, The VVitch carves out its own New England topography. Each locale is endowed with a distinctive sense of spatiality and texture: from cramped domestic interiors (filled with straw beds, food sacks and heavy beams) to the dense silver birches, white pines and thickened air of the witch’s forest, the river bed or withered fields of corn. In folk horror, a supernatural presence in the landscape (demons, witches or the Devil himself) causes terrible events. Alternatively, folk beliefs that are tied to the nature-based rhythms of the countryside (for instance, the need for human sacrifice) will bring about violence. Whether beautiful, menacing or somewhere in-between, remote and rural landscapes become the primary locale for folk horror’s revelation of a “dark heritage”. That dark heritage can manifest as demonic possession, pagan revelry, male witch-hunting, witchcraft or ritualistic human violence. It is The VVitch’s atmospheric imagination of earth and air that really interests me, though. As the family begins their trek across the grassy plains, Eggers’ film calls to mind the frontier imagery of the American western. The film’s score (composed by Mark Kovern) suggests a shift back into nature that is much more ominous and primordial, however. The ascending sound of stringed instruments dominates over the rattling of the wagon and the mother’s evangelical singing. Bucolic imagery of the wagon moving beneath pastel skies is offset by a steadily growing sonic unease. When the family gather in silence around a nighttime campfire, a small glow against a painterly sea of black, the film’s soundscape reaches an affectively piercing intensity. Sonic dissonance seems to emanate from all directions, creating the impression that the air itself is screaming. When Eggers cuts from the campfire at night to a vast, cloud-filled sky, the sound of the strings fades out, replaced by the eerie bowing of a nyckelharpa (a medieval keyed violin). In close-up, William kneels, pressing his face into the earth. Shifting focus, the film reveals all the family also kneeling in the soil and praying over the location of their new farm. After William and Katherine (Kate Dickie) raise their arms in thanks, new sets of wailing sounds begin (provided by Toronto’s The Element Choir). The intentional focus of the camera then bypasses the film’s human characters, moving outwards and upwards towards the woods. Chaotic vocal sounds are visually aligned with the backdrop of the forest. As Marcus K. Harmes notes, lingering shots on “fields, woods and villages” are common in British folk horror, helping to craft a “world defined by rural horror”. 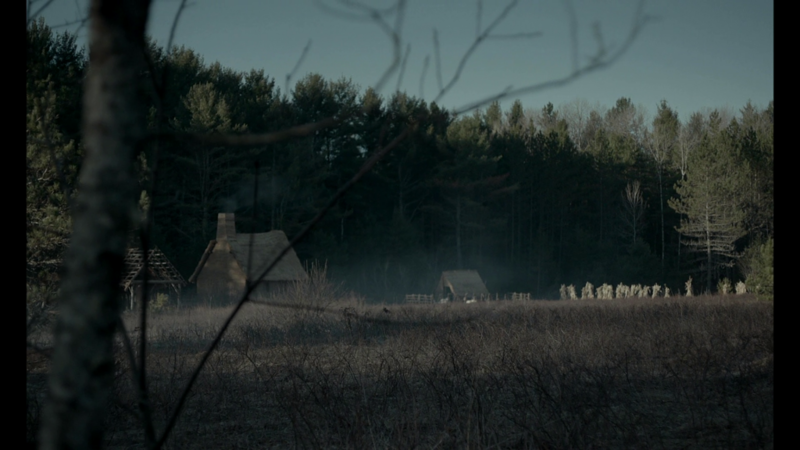 In The VVitch, also, the film will often linger on shots of the surrounding landscape. In the scenes described above, the score is an-empathetic to the human but in rapport with an invisible presence that resides ‘in’ nature. As it mediates horror through landscape, the sonic sense and through flows of air, The VVitch de-emphasises the formal importance of the human. Eggers’ film alerts us to the centrality of mood in folk horror and the non-human materiality of mood itself. In the context of nineteenth-century art history and aesthetics, the term Stimmung was also used to refer to the moody textures of landscape painting. Georg Simmel’s essay “The Philosophy of Landscape” (1913) is a crucial text for us in this regard, not least because it was a formative influence on Béla Balázs. Discussing the aesthetic transformation of nature into a landscape, Simmel suggests that mood is the primary carrier of a landscape. It is mood that endows landscape with an overall sense of unity (be it “cheerful or serious, heroic or monotone, exciting or melancholic”), bringing all of its different material elements (trees, hills, stones) together. Significantly, Simmel does not delimit mood to the objective/material expressions of a landscape or to the subjective experience of the artist/beholder. Rather, the moodiness of a landscape comes into being at the moment of its being seen. Drawing on the legacy of Stimmung, Sinnerbrink has more recently argued for film mood as a correlative encounter. Following in the wake of earlier film theorists such as Balázs and Eisner, he sees mood as existing both at the level of a film’s aesthetic design and at the level of the viewer’s embodied response. In a highly pertinent addition, Sinnerbrink goes on to suggest that mood has a world-disclosing function. That is, mood helps to affectively orient or attune us to the dynamics of each unique “film world”. This definition raises important questions of visibility. What particulars of a film are revealed and when? What particulars are withheld and why? While Sinnerbrink is not specifically concerned with folk horror filmmaking or with the felt but often invisible sensuality of the air, I think we can apply the world-disclosing function of mood that he identifies to Eggers’ treatment of the supernatural. Consider the following mood-evoking sequence: Thomasin is dimly seen exiting the farmhouse at night, the dull glow of her lantern providing the scene’s only visible lighting source. The lantern guides Thomasin’s path towards the barn and also encourages a shared intentional focus. A mysterious rustling is heard and Thomasin halts. As she moves forward again, another tense, non-melodic musical sequence starts up. Thomasin’s footsteps along the yard correspond with by now familiar shrill clanging sounds, orienting us to imminent danger. As she approaches the barn, Kovern’s score intensifies. At the threshold of the barn, Thomasin holds her lantern aloft. The light that suddenly illuminates her face reveals her to be looking at something. At this point, The VVitch breaks its link with Thomasin’s human vantage point – it cuts to a ground-level close-up. That shot reveals the figure of a hare, crouched on the earthen, straw-strewn floor of the barn. The hare is looking back at Thomasin and silently twitching. In western European folklore, the hare is known as one of the witch’s animal familiars or else is the witch herself, metamorphosed. In this sequence, the folklore that surrounds the witch is transformed into a larger affective and environmental encounter. Often, the source of our unease is not visible on-screen, or it cannot be conclusively identified. Mood “pulls ambient details into its orbit” as Noël Carroll explains, ‘colouring’ the entire area of perception with ambient feeling. In folk horror, ambient feelings of dread, unease and anxiety are associated with period settings or environments that keep the past alive. As is typical of folk horror, imaginary figures and/or spaces will combine with an emphasis on the material. In interview, Eggers has suggested that The VVitch’s shot choices were guided as much by mood as by story information, especially in terms of capturing the different textures of wood, animal dung, the hearth, mist and mud. In the scene previously described, rustic settings (the farmhouse, the barn) and pre-modern objects (Thomasin’s lantern) help to situate us in an agrarian past. Partially-lit spaces, off-screen sounds and background music help build mood towards a later, more explicit disclosure of the supernatural. As Sinnerbrink observes, mood-cues are often affectively charged. They only become orientational through “the expressive manner in which the film-world has been disclosed”. In and of itself, a close-up is not confronting, of course. As Eggers’ close-up on the hare/witch is accompanied by other expressive techniques of mood, it becomes disturbing. Like the film’s recurrent shots of nature, the close-up on the hare/witch cues a shift from the human to the supernatural. 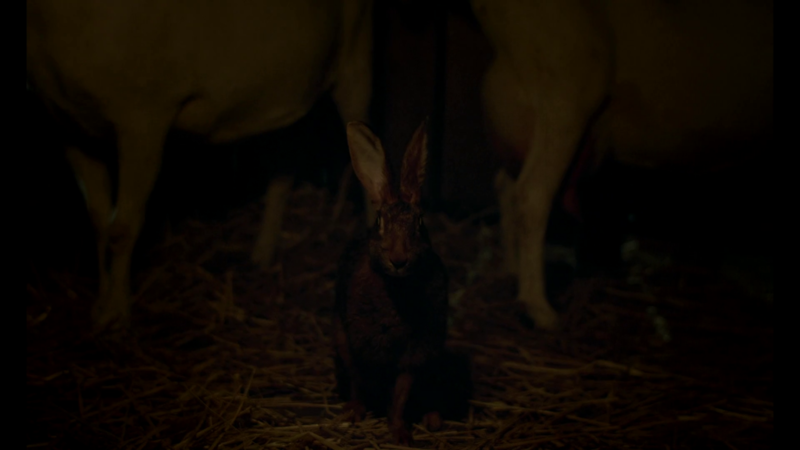 Filmed at ground level and with the shot held on the hare for a number of intense musical sounds, Eggers also creates the eerie impression that the hare/witch is not only looking at Thomasin, but also at us. In his essay “The Philosophy of Landscape”, Simmel writes that a “landscape permeates”, capturing the dispersive sensuality that is an encounter with mood. Given its focus on landscape as well as its reliance on mood, I think we would do well to approach the sensuality of mood in folk horror (and film, more generally) as air-borne. After all, both mood and air suffuse human experiences and the environmental. Both can be felt as more or less dense at particular moments in a film and both move in and out of visibility (a crucial dynamic for The VVitch). In addition, mood itself has an aerial resonance. In popular language, we often invoke air-based images, phrases or metaphors when describing mood. Positive moods make us feel high, as though we are walking on air. By contrast, negative moods weigh us down or dampen the spirits. Despite their different perspectives, contemporary scholars of film mood such as Sinnerbrink and Carroll also describe mood in aerial terms as being diffuse, free-floating, drifting or unanchored. Discussing a scene from F.W. Murnau’s Nosferatu (1922), for example, Sinnerbrink identifies the slow and deliberate gestures of Count Orlok (Max Schreck) as creating a “mesmerising and suffocating air”. While mood is related to character-based movement here, elsewhere Sinnerbrink connects mood to more ambient and elusive qualities, such as the play of light and shadow, film rhythm, pacing and dramatic tempo. The whole room is saturated with every kind of drama. The cigar smoke is poised menacingly over the ashtray’s throat. The dust is treacherous. The carpet emits venomous arabesques and the arms of the chair tremble. Now the suspense is at freezing point. Waiting. One sees nothing as yet … . According to Somani, the genealogy of mood in film theory (as it derives from Stimmung) urges us to attend to the affective tone of all film environments, including architected, highly stylised and designed environments. Epstein’s conception of mood can therefore be situated alongside other early film critics who were similarly invested in the stylistics of film mood, namely, Balázs and Eisner. All discuss mood in powerful albeit non-human terms, also revealing a nuanced sensitivity to how landscape in film can be used to disseminate mood. Cognitive accounts of mood tend to approach mood through the subjective processing of mood-cues to fathom emotion, narrative and character. In these terms, it is the viewer who completes the ‘moodiness’ of a film. For Carl Plantinga, films do not have moods – only humans do. Also employing the mood-cue approach, he distinguishes between the subjective mood of the viewer and what he calls “art moods” (the objective expressions of the film). Though he delimits mood to the human, Plantinga nonetheless suggests that film is imbued with an “affective character” that can lead to or correspond with the moods of the viewer. By contrast, what the transition of Stimmung into early film theory suggests is that mood is not owned by any one ‘body’ or by a human body/subject. Epstein, Eisner and Balázs certainly do not delimit mood to the human. In Balázs, a close-up on the splintering of a timber beam enacts “a mood of impending catastrophe”. For Balázs, especially, it is the conjunction of the close-up with the display of different material textures that engenders mood. Those textures can either belong to human events and faces, to the surface of a landscape or to the aura of objects. Mood defies “the objectivity of the photographic apparatus” as Balázs writes, presenting us with an entire world that is “coloured by a temperament, illuminated by a feeling”. For Balázs, following Simmel, mood mingles the subjective and the objective. An examination of mood in The VVitch reveals linked properties to the elemental life of the air. For this article, the sensuality of mood in the cinema cannot be constrained to the bounds of individual bodies/subjects. Moods flow and suffuse, moving in and out of visibility, like currents of air. In Air and Dreams, the philosopher Gaston Bachelard proposes that there exists a “regular filiation between the real and the imaginary”. For Bachelard, the imagination does not involve a flight of fancy from the world. It cannot be delimited to the human, either. Traditionally, the imagination is understood as the hermetic formation of images in the mind. What Bachelard conceives as the “material imagination” is a “plastic mediator”. The material imagination conjoins the inner with the outer and the human with the sensible world, mediating between the production of new images and the concrete life of substances. Imagery of a darkened earth is matched with Kovern’s dissonant score. In combination, landscape, sound and music portray the supernatural as a material if not fully visible force in the film’s rural environment. After Samuel’s kidnapping the witch appears in an unidentified space that is partially lit by firelight. This time the witch takes the form of a naked crone, pounding out flesh against a block of wood. Rather than making the violence fully visible, it is the matter of sound that brings horror to the fore. Significantly, the sound of the witch’s pounding also moves from the diegetic to the non-diegetic, becoming an integral, rhythmic feature of Kovern’s score. Between ellipses, a blurred close-up on the witch shows her smearing a bloodied ointment across a branch. After revealing the witch to be lying in a pool of moonlight, the film cedes to another stretch of black. If, as Bachelard insists, the elements can activate particular groups of images, then I think we can align The VVitch (and folk horror, more generally) with the imagery of nebulous matter. Out of the darkness, a blocky, hazy figure appears. Accompanied by a choral cacophony, this figure is lit up against the image of a full moon on the horizon. At first, it is unclear whether or not this figure represents the local witch, a passing cloud, or part of the forest. As the witch’s newly accessed occult powers begin to unfold, the figure takes on a more explicitly aerial incarnation. Its edges begin to waft and streak outwards, as if caught by strong gusts of air. In keeping with Balázs’ evocative description of atmosphere, the supernatural is borne of “nebulous matter” here. 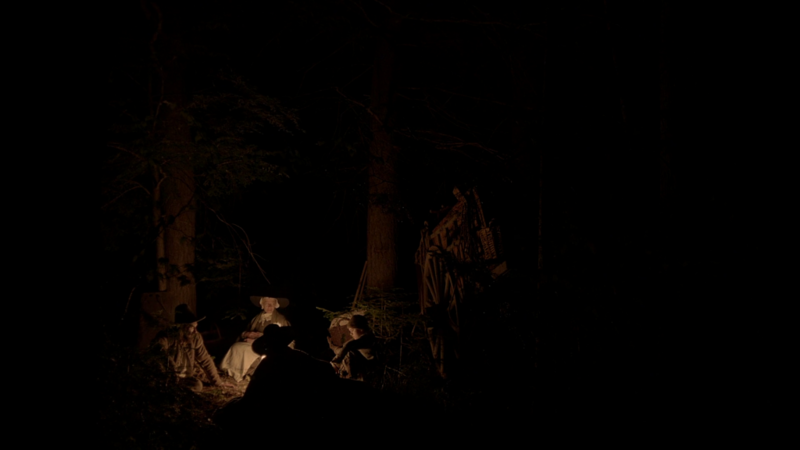 Eggers’ film largely keeps the witch and the Devil off-screen, using atmospheric images and sounds in their stead. The formerly darkened, hidden or invisible is revealed by images relating to earth or air, such as when the previously clouded figure transforms into a perched black bird. The local witch now assumes the guise of a raven, suspended in the night sky. It is not only movement that renders air visible, then. Lighting, space and sound can all serve to activate the mood-creating potential of air. In The VVitch, mise en scène and Eggers’ intermedial references to painting also foreground properties of aeration. Often, the combined effects of lighting, costuming and the composition of figures will create highly painterly effects. Across the film’s daytime sequences or at night, moments of stillness recur. In the absence of historically apposite New England art traditions, Eggers and the film’s production team turned to scenes from seventeenth-century Flemish, French and Dutch painting. As with the naturalistic, light-flooded spaces of Dutch genre painting, it is the space between bodies or the spaces between bodies and objects that catches the eye. At the same time, the transference of a painterly aesthetic into film also brings to life details in the setting, imbuing these with an arresting physicality. Inside the farmhouse, for example, the candles that surround the family visibly flicker and splutter (the result of natural air currents and slight shifts in the room’s humidity). The subtle flickering of a single candle flame becomes as compelling as any human gesture. Outside, a close-up on Thomasin’s still profile catches her hair being suddenly lifted by the breeze (anticipating an aerial freedom for Thomasin that is yet to come). During other scenes, the light that is cast by a single candle flame enhances the expressivity of the characters’ faces, recalling the pensive candlelit paintings of Georges de La Tour and other European candlelight artists. In The Haunted Screen, Eisner picks up on the mood-based significance of light and hazy lighting, in particular. Discussing the interiors of New Year’s Eve, she identifies smoke and the haze of a lamp as thickening the light and creating a smoky atmosphere. Elsewhere, Eisner explicitly describes Stimmung as an aerial quality that is achieved through the sensuality of light. Stimmung “hovers around objects as well as people”, she writes. That hovering can be achieved through the filming of a ray of sunshine or through studio-based lighting. Yet again, in Eisner, we encounter the notion of mood as a phenomenon where air is made visible – during the filming of nature (veiled landscapes), or within studio interiors (by light emitted from a chandelier or a hazy lamp). Similarly, for Balázs, “stylized versions of nature” are necessary. It is not reality captured by the cinema that interests these early thinkers of mood. To materialise the ephemera of mood, reality must be imaginatively reconfigured by the medium of cinema. Throughout Air and Dreams, Bachelard tends to associate the air with a general sense of lightness, transparency and freedom although he also indicates that the aerial imagination can give rise to denser forms. For example, in his discussion of the literary works of Edgar Allan Poe he refers to air becoming ‘weighted’. In weighted or clouded air, lines lose their edges. Visual and spatial certitude is also lost. Clouded air makes for the “undoing of place and spatial differentiation”, transforming the earthly into the ethereal and the airborne, as Steven Connor aptly remarks when discussing the properties of haze. Most importantly, for our purposes, Bachelard suggests that weighted air can channel and help to elicit darker, heavier moods (for instance, feelings of sadness, melancholy, terror). By draining the colour palette, restricting lighting sources and making extensive use of natural cloud cover, Eggers imbues The VVitch with a naturalistic gloominess. That gloominess is punctuated only by unexpected revelations of the supernatural (a hare, a raven, Black Phillip). As mentioned earlier, depopulated landscape shots and unsettling uses of film sound hint at another presence that is ‘in’ the New England wilderness. In addition, the effects of weighted air combine to create a strong sense of foreboding: from low-hanging clouds and overcast skies to the atmospheric imagery of shadows, gases and vapours. For instance, Caleb’s demonic possession is transmitted through the air by means of the witch’s breath and magic. Afterwards, when Thomasin and Katherine attempt to revive Caleb, candles smoke and dense shadows gather in the corners of his sick room. In nebulous reveries, air will weigh “down all objects on which it dwells”, transforming entire environments into death shrouds. More than just decorative background or even a marker of weather and climate, the clouded air and weighted atmospheres of The VVitch cue us into its material and specifically aerial imagination of folk horror. Discussing The Blood on Satan’s Claw, both Paul Newland and Harmes identify an earthbound, almost archaeological sensibility to this tradition. As with the literal digging up of the Devil that opens Haggard’s film, demonic forces or ancient cultures and ideas re-emerge “from the ground up”. Scovell, too, has underscored folk horror’s terrestrial tendencies as “the evil under the soil, the terror in the backwoods of a forgotten lane, and the ghosts that haunt stones and patches of dark, lonely water”. What, then, of the atmospheric importance of the air in folk horror? In The Blood on Satan’s Claw, ground-level shots that depict the tilling of the soil are followed by a clear, vertical shift. After the Devil is discovered, the film’s credits unfold against a slate-grey sky featuring branches moving in the breeze and the extreme close-up of a bird. Though ‘atmosphere’ is a term that is often used to describe the landscapes and the feeling of folk horror, it has yet to be associated with the sensuality of film mood or the mood-based imagination of violent air. In his introduction to folk horror, Andy Paciorek suggests why folk horror has a dedicated investment in imagery relating to the air. Likening folk horror to a ream of mist, he describes such horror as “atmospheric and sinuous. It can creep from and into different territories yet leave no universal defining mark of its exact form”. Paciorek’s evocation of folk horror as atmospheric, shifting and mist-like can be taken literally. Rather than unearthing the Devil, I propose that the supernatural horrors of Eggers’ film are carried in and through the air. While all film environments are of course aerated, The VVitch reveals how horror can move between human and non-human bodies, objects and the environment, activating mood-charged sequences as it does so. In The VVitch, the supernatural is portrayed as something that is emitted or, more precisely, exhaled by the film’s environment. After the family’s goats begin to milk blood, Eggers cuts from the image of blood slowly seeping into hay to Caleb’s scratched, deathly-pale face. We then understand that Caleb’s body, too, has been saturated with the demonic. When Katherine asks whether or not Caleb’s illness is the result of witchcraft, William responds: “What witch? Who does this, then, who?” Recalling Bachelard’s view of the imagination as a lining to our perception, we can now better understand why horror might be kept off-screen, hidden by shadows, lodged within darkened corners of the frame, or only materialised through music and sound. For Bachelard, the material imagination is attached to the world but also inclusive of that which is hidden, obscure or unknowable. In The VVitch, horror exhibits a precarious visibility that makes it difficult to latch onto. Think of Caleb’s possession scene and his eventual death, suffused by the Stimmung of a cold, grey light. The sequence begins with Katherine and Thomasin outside, shucking corn. The child Mercy is seated with her back to us, softly singing a song about Black Phillip. As the camera inches closer and closer towards the back of Mercy’s neck, the creeping comportment of the film orients us towards a marked shift in mood. After Caleb’s screams rend the air, the family run inside. The intentional focus of the film stays on the ears of corn that hang down the wall of the farmhouse. In order to manifest the supernatural, the film must shift its attention away from grounded, terrestrial imagery (planks of wood, ears of corn) and take in a far more mobile, diffusive substance: air. Upstairs, Caleb is seen quivering, gasping and heaving for breath against his sweat-stained pillow. Writing of The Exorcist (William Friedkin, 1973), Davina Quinlivan suggests that the foregrounding of breath that occurs in this film is as much theological as it is affective. During the film’s iconic possession scenes, for example, Regan (Linda Blair) is not just Regan but also the demon named Pazuzu. Lapses in Regan’s breathing aurally manifest the splitting of her soul, gesturing towards the demonic presence of “the other, The Unseen”. In Eggers’ film, by contrast, horror does not just possess individual bodies and disrupt human breath: horror possesses entire spaces. It flows through and suffuses the film’s exterior and interior locales (the forest, the plains, the sick room). As Bachelard rightly insists, the element of air is inspirational, not just respirational. By extension, air in film need not just be delimited to processes of oxygenation. In The VVitch, the supernatural is revealed through its effects upon bodies and objects or as atmospheric shifts in the environment. When Caleb screams about the nature of sin, particles of dust appear and float in the space that surrounds him. William and Katherine are forced to hold Caleb down as his body arches up off the ground. After Eggers cuts to a shot of Thomasin restraining the twins, they collide with the ears of corn that hang from the roof, causing them to subtly swing. According to Bachelard, “movement takes precedence over matter” when it comes to the aerial imagination. In Caleb’s possession scene, invisible horrors are brought into visibility through a series of quick and intense aerial changes. As Caleb’s body continues to heave and convulse, his jaw locks. William and Katherine have to pry his mouth open forcibly. Caleb then spits out a bloodied red apple, causing the twins to immediately accuse Thomasin of making a bargain with the Devil. The site of horror jumps from Caleb’s fragile body to Thomasin, a seventeenth-century woman now falsely accused of witchcraft. After William gathers all of the family to pray against the Devil, the supernatural focus shifts again. A faint, high-pitched sound is heard. Devoid of musicality, this (non-diegetic) sound is reminiscent of the film’s choral vocals as it imbues the entire on-screen space with a general mood of apprehension. Though this sound cannot be attached to any visible source, it suggests a proximate, malevolent presence that is inside the room. Jonas and Mercy suddenly bend over in pain, claiming that they are unable to remember their prayers. After the twins fall to the floor, writhing and screaming, Caleb, Jonas and Mercy all begin to chant the same verse and to arch in unison. All three children are lifted off the ground by an imperceptible, unknown force. Rather than delimiting horror to individual figures and forms, Eggers conveys the folk horror of The VVitch as environmental and as air-borne. During the scene of Caleb’s ultimately fatal possession, air fulfils its primary function as an elemental transporter. Horror moves from the site of Caleb’s twisted, wracked body then to Thomasin and the twins, also filling up the space that surrounds the family with a partially visible, immanent and unidentifiable threat. As it spans both human and non-human forms, The VVitch configures horror as something wicked that is palpably felt in the air. Just as there is no set composition for any given volume of air – air always varies from place to place – so does the imaginative intermingling of air and film mood help to generate distinctive atmospheres. Yet to be fully discussed in film and film-philosophical studies is the subject of how mood is conveyed through the images and sounds of matter. To date, horror scholarship has focused much of its attention on the violence that is done to representational bodies or on the affective violence that is wrought upon the body of the viewer. What if, instead of focusing on film bodies in this way, we shift our focus onto moody imaginings of the elements? Both the materiality of mood in early film theory and Bachelard’s work suggest rich possibilities for analysis, enabling us to interpret a film’s material imagination of horror and its sensuous manifestations of the invisible. As one possible path along this route, this article has considered the role that air, atmosphere and environment play in The VVitch. As a contemporary instance of folk horror, The VVitch filters the supernatural through its historical setting, through nature and landscape and through mood-based renderings of the air. I should not close without mentioning another form of the aerial imagination that is relevant to The VVitch: the dream of flight. For Bachelard, imaginary “air, specifically, is the hormone that allows us to grow psychically”, a growth that is nowhere more evident than in the dream of flight. It is not until The VVitch’s close, however, that we encounter an aerial freedom, especially in the case of Thomasin. After having been blamed for the actions of others, falsely accused of sin, seduction, rebellion and witchcraft, then near-murdered by her mother, it is Thomasin who outlives all her family members. 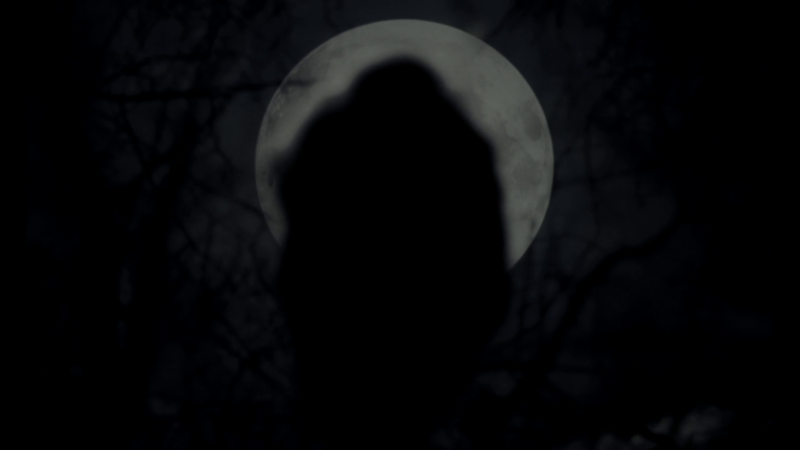 She is filmed looking out onto the forest, appearing as a hazy figure, her edges visibly blurred against the landscape. 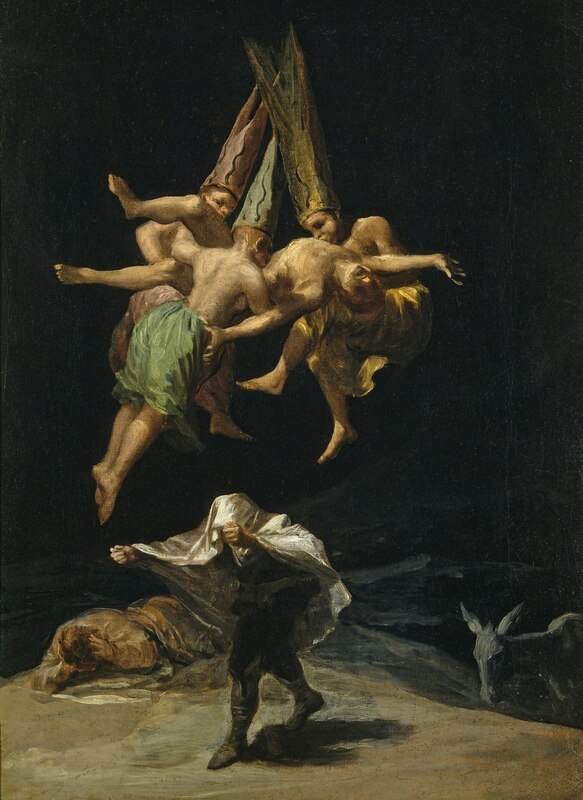 Reprising the dream of flight, the last scene of The VVitch includes a pointed reworking of Goya’s The Witch’s Flight (1798) (a painting that is, coincidentally, also known as Witches in the Air). Thomasin and the other women all begin to levitate. Rather than ending on a note of horror, the final image of Thomasin becoming witch is the only aerial ecstasy that Eggers’ film provides. By transforming Thomasin into its titular witch, The VVitch radically displaces the last of its human folk from the being that is at the ontological centre of its folk horror world. Gaston Bachelard (trans. by Edith R. Farrell and C. Frederick Farrell), Air and Dreams: An Essay on the Imagination of Movement (Dallas: The Dallas Institute Publication, 2011), p. 4. Bachelard is invoking the French poet Paul Valéry. Ibid., p. 9. On the need to attend to the embodiment of narrative and signification in film theory see also Saige Walton, Cinema’s Baroque Flesh: Film, Phenomenology and the Art of Entanglement (Amsterdam: Amsterdam University Press, 2016), pp.127-134. In this regard, the elements can create composite material images. See Bachelard, Air, p. 11. Adrian Martin, “Different, Even Wholly Irrational Arguments: The Film Philosophy of Béla Balász” in Bernd Herzogenrath (ed. ), Film as Philosophy (Minneapolis: University of Minnesota Press, 2017), pp. 45–65. Jessica Bloom, “Designer-Turned-Director Robert Eggers Discusses his Horror Film The Witch”, Format Magazine, 15 March 2016, https://www.format.com/magazine/features/design/the-witch-robert-eggers-movie-interview (last accessed: 21 August 2017). On Eggers’ fabricated dialect see Michael Bergeron, “Robert Eggers on The Witch”, Free Press Houston, 18 February 2016, http://www.freepresshouston.com/robert-eggers-on-the-witch/ (last accessed: 21 August 2017). Brenda S. Gardenour Walter, Our Old Monsters: Witches, Werewolves and Vampires from Medieval Theology to Horror Cinema (Jefferson: McFarland Press, 2015), p. 92. In fifteenth-century witchcraft treatises, such as the Malleus Maleficarium (Hammer of Witches), male authors were particularly concerned with the witch’s vanishing powers, detailing the witch’s stealing away of young children and male genitalia. See Walter, Our Old Monsters, p. 89, fn. 166. Barbara Creed, The Monstrous-Feminine: Film, Feminism, Psychoanalysis (London: Routledge, 1993), p. 76. Walter, Our Old Monsters, p. 97. In medieval colour theory these were the colours of the witch’s poisons. The witch’s ability to concoct poison from the natural world was a power gifted to her by the Devil. See Walter, Our Old Monsters, p. 91. Ibid., p. 96 and p. 89. Eggers quoted in “Robert Eggers on the Witch”, Time Out, 21 March 2016, https://www.timeout.com/sydney/film/robert-eggers-on-the-witch (last accessed: 24 September 2017). Eggers quoted in Lorenzo Baldassari and Alberto Libera, “The VVitch: A New-England Folktale”, Lo Specchio Scuro, http://specchioscuro.it/the-witch-intervista-robert-eggers-interview/ (last accessed: 16 August 2017). Adam Scovell, Folk Horror: Hours Dreadful and Things Strange (Leighton Buzzard: Auteur Publishing, 2017), p. 9. Leon Hunt, “Necromancy in the UK: witchcraft and the occult in British horror” in Steve Chibnall and Julian Petley (eds), British Horror Cinema (London: Routledge, 2002), p. 83. Gatniss quoted in Scovell, Folk Horror, p. 7. Marcus K. Harmes, “The Seventeenth Century on Film: Patriarchy, Magistracy, and Witchcraft in British Horror Films”, Canadian Journal of Film Studies, Vol. 22 No.2 (Autumn 2013), p. 64. Scovell, Folk Horror, p. 7. Scovell includes examples such as the Swedish/Danish silent Häxan: Witchcraft Through the Ages (Benjamin Christensen, 1922), the Australian film Wake in Fright (Ted Kotcheff, 1972) and The Texas Chain Saw Massacre (Tobe Hooper, 1974) and The Blair Witch Project (Daniel Myrick and Eduardo Sánchez, 1999) from North America. Scovell also includes The VVitch as an example of contemporary folk horror. See Scovell, Folk Horror, pp.165–68. Scovell, “The Folk Horror Chain”, Celluloid Wicker Man, 25 September 2014, https://celluloidwickerman.com/2014/09/25/the-folk-horror-chain/ (last accessed: 16 September 2017). On the importance of landscape see Scovell, Folk Horror; Harmes, “The Seventeenth Century” and Paul Newland, “Folk horror and the contemporary cult of British rural landscape: the case of Blood on Satan’s Claw” in Paul Newland (ed. ), British Rural Landscapes on Film (Manchester: Manchester University Press, 2016), pp. 162–79. Peter Hutchings quoted in Newland, “Folk horror”, p. 162. Here, I should note that my use of the term ‘atmosphere’ pertains to the feeling of a mood rather than to the cinema’s materialisation of weather. On this see Kristi McKim, Cinema as Weather: Stylistic Screens and Atmospheric Change (London: Routledge, 2013). Harmes, “The Seventeenth Century”, p. 67. Vlad Ionescu, “Mood (Stimmung)/Blandness (Fadeur): On Temporality and Affectivity” in Sjored van Tuinen (ed. ), Speculative Art History: Analysis at the Limits (Edinburgh: Edinburgh University Press, 2017), p. 82. Stimmung includes a number of affiliated concepts, such as facing, sentiment and aura. See Giuliana Bruno, Atlas of Emotion: Journeys in Art, Architecture, and Film (Chicago: University of Chicago Press, 2002), p. 48 and Giuliana Bruno, Surface: Matters of Aesthetics, Materiality, and Media (Chicago: University of Chicago Press, 2014), p. 258, f.n. 35. Bruno, Surface, p. 128. Bruno’s use of ‘resonance’ is suggestive of music. See also Robert Sinnerbrink, “Stimmung: Exploring the Aesthetics of Mood”, Screen, Vol. 53, No.2 (Summer 2012), pp. 148–63. Antonio Somani, “Il volto delle cose: Physiognomie, Stimmung e Atmosphäre nella teoria del Cinema di Béla Balázs”, Rivista di estetica, Vol. 32, No. XLVI (2006), pp. 141–60. Georg Simmel, “The Philosophy of Landscape”, Theory, Culture and Society, Vol. 24, No.7–8 (2007), p. 28. In a previous scene, a close-up on the hare/witch occurs immediately before William’s rifle backfires. In medieval folklore, crossing the hare’s path was considered a sign of bad luck. Noël Carroll, “Art and Mood: Preliminary Notes and Conjectures”, The Monist, Vol. 85, No.4 (2003), p. 528. Unlike the emotions, moods do not have an intentional focus and they are experienced as longer lasting. Most scholars agree that moods are felt as affective mental states. See Carroll, “Art and Mood”. Adam Scovell, “The Wicker Man (1973) — Defining of the Folk Horror”, Celluloid Wicker Man, 16 September 2013, https://celluloidwickerman.com/2013/09/16/the-wicker-man-1973-defining-of-the-folk-horror/ (last accessed: 26 August 2017). Eggers quoted in Baldassari and Libera, “The VVitch”, n.p. On the diversity of rhythm and its connection to negative affects see Saige Walton, “Cruising the Unknown: Film as Rhythm and Embodied Apprehension in Alain Guiraudie’s L’Inconnu du lac/Stranger by the Lake (2013)”, New Review of Film and Television Studies, Vol. 16, No. 3 (2018: forthcoming). Simmel, “The Philosophy of Landscape”, p. 26. Jean Epstein (trans. Tom Milne), “The Senses 1 (b)” in Richard Abel (ed. ), French Film Theory and Criticism: A History/Anthology, Volume 1: 1907–1929 (Princeton: Princeton University Press, 1988), p. 242. Ibid. “True tragedy remains in abeyance”, Epstein writes. Somani, “Il volto delle cose”, pp. 141–60. Translation by the author. Lotte H. Eisner, The Haunted Screen: Expressionism in the German Cinema and the Influence of Max Reinhart (London: Thames and Hudson, 2008), p. 186. There is a strong connection to German Romanticism here as well. Ibid., p. 182. For a complementary discussion on the role of landscape in this film see Tyson Wils, “Umwelt and the Paradoxes of Landscape in Lupu Pick’s Sylvester and Pier Paolo Pasolini’s Teorema”, Senses of Cinema, 66 (March 2013), http://sensesofcinema.com/2013/feature-articles/umwelt-landscape-and-lupu-picks-sylvester/#24 (last accessed: 2 October 2017). Carl Plantinga, “Art Moods and Human Moods in Narrative Cinema”, New Literary History, Vol. 43, No.3 (2012), pp. 455–75. Plantinga adopts the mood-cue approach from Greg M. Smith. Mood-cues are not only centred on character-based features such as facial expressions; they can include broader aesthetic elements, such as colour, camera angles and mise en scène. Béla Balázs (trans. Rodney Livingstone) in Erica Carter (ed. ), Béla Balázs: Early Film Theory: Visible Man and The Spirit of Film (New York: Berghahn Books, 2010), p. 43. Glen A. Mazis, Merleau-Ponty and the Face of the World: Silence, Ethics, Imagination and Poetic Ontology (New York: State University of New York Press, 2016), pp. 258–59. Gaston Bachelard (trans. Edith R. Farell), Water and Dreams: An Essay on the Imagination of Matter (Dallas: Pegasus Foundation, 1983), p. 2. Somani, “Il volto delle cose”, p. 50. Ibid., p. 22; (italics mine). Eisner, The Haunted Screen, p. 188. Balázs, Béla, p. 52. As it is nature reconfigured by cinema that concerns Balázs, such stylisation can occur inside studio spaces. A sustained study of the aerial sensuality that connects Epstein’s photogénie to mood in early film theory has yet to be undertaken. Steven Connor, “Haze: On Nebular Modernism”, Steven Connor, 12 May 2006 http://stevenconnor.com/haze.html (last accessed: 5 January 2018). My thanks to Joseph Pomp who first alerted me to this reference. Walter, Our Old Monsters, p. 69. Newland, “Folk Horror” and Harmes, “The Seventeenth Century”, p. 72. Adam Scovell, “Where to begin with Folk Horror”, BFI, 5 June 2017, http://www.bfi.org.uk/news-opinion/news-bfi/features/where-begin-folk-horror (last accessed: 29 September 2017). By contrast, air in Witchfinder General is associated with human violence. The film’s opening is accompanied by heavy winds as an unnamed woman is dragged to a set of gallows on the top of a rural hillside. She is then strung up by a merciless mob, watched from afar by Hopkins. The neglected importance of the air in this tradition resonates with Luce Irigaray’s philosophical critique as well. See Luce Irigaray (trans. Mary Beth Mader), The Forgetting of Air in Martin Heidegger (Austin: Austin University Press, 1999). Andy Paciorek, “From the Forests, Fields and Furrows: An Introduction by Andy Paciorek”, Folk Horror Revival, https://folkhorrorrevival.com/about/from-the-forests-fields-and-furrows-an-introduction-by-andy-paciorek (last accessed: 17 September 2017). Kevin L. Ferguson, “Panting in the Dark: The Ambivalence of Air in Cinema”, Camera Obscura, Vol. 26, No.2 (2011), p. 35. For an account of breath that speaks to passages of air moving between bodies and the environment see Davina Quinlivan, The Place of Breath in the Cinema (Edinburgh: Edinburgh University Press, 2013). For an account of cinematic movement as itself a kind of enworlded breath see Amelie Hastie, “A Cinema of Compassion”, LOLA, Issue 4 (2013), http://www.lolajournal.com/4/compassion.html (last accessed: 19 November 2017). Quinlivan, The Place of Breath, p. 26. The accusations against Thomasin anticipate the real-life persecution of women that occurred during the Salem witch trials. The apple plays on the Biblical gendering of ‘sin’ (Eve) as well as fairytales. Just before Caleb’s death, Caleb recites a prayer from John Winthrop (one of the Puritan founders of New England). Harmes, “The Seventeenth Century”, p. 68. In The VVitch, the forest is figured as being spatially and ontologically apart from the human. It is affiliated with animals, with witches and with a pagan sensuality that is clearly distinct from the Puritan order. Alexandra Heller-Nicholas has also discussed Eggers’ reference to this painting. See Heller-Nicholas, “Season of the Witch”, Overland, 22 March 2016, https://overland.org.au/2016/03/season-of-the-witch/ (last accessed: 17 September 2017).